Eric was about 4 1/2 months old when he came to live at In-Sync. Out of the 7 cubs we rescued in August 2000, Eric was in the best shape. You could still see a few ringworms on him, but we knew he had been much worse from the pictures we had seen of him at a younger age. When Eric arrived, he seemed unusually scared and confused. He was so set back by his illness that he took his treatments without protest. He didn’t know what to think about the treatments and special baths. He was always hungry and thirsty. 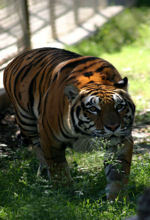 Eric shared an enclosure with his sister Emma, whom he had a very close relationship. He was a very good brother, letting her do almost anything she wanted to him. He was very caring and gentle, yet strong and bold and was considered the leader and protector of all the “babies” he lived with. All of his buddies respected and loved him a great deal. He looked forward to feeding time and would wrap his front paws around his bowl as he ate. He loved the water and, for awhile, made a nightly ritual of splashing in his tub. Tragically, on April 21, 2007, just 5 days shy of his 7th birthday, Eric was put to rest after a year long battle with cancer. On his last day, Eric honored us by getting in his swimming pool that was built in his honor for the first and last time. 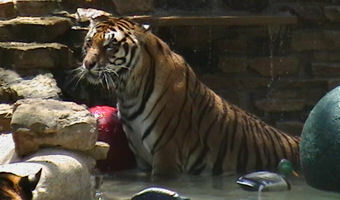 Although he will be forever missed, his memory will live on through the legacies he left behind, including “Eric’s Pool” that was made possible by a very special guardian angel and several other generous supporters and is now enjoyed by his friends; the subsequent pools that were made possible by the same guardian angel; the new training program that was implemented to train Eric to do basic commands so that we could administer medication safely and without stress and is now being successfully used on all of our cats; and the knowledge gained from the pathology reports that are educating the very same medical professionals that were baffled when Eric was sick. We know Eric is looking down and chuffing.